Trip to Bhutan - Road trip from Siliguri to Thimpu - Ghumakkar - Inspiring travel experiences. It was a spur of the moment decision to take this trip to Bhutan without much plans, aim, mission and vision. Such unplanned trips, more often than not, turn out to be the best and most memorable ones. When a dear friend decided to come all the way from Afghanistan to pay me a visit I decided on this trip. However, at the back of mind there was Taksang Gompa, one of the ten most precariously placed shrines in the world that I had to see for myself. When we took off from Siliguri on 13th Sep 2012 in my Scorpio, the idea was to drive straight to the capital Thimpu and that is what we did albeit after a night halt in Phuntsoling, the Bhutanese border town adjacent to India’s last frontier town, Jaigaon. Distance between Siliguri and Phuntsoling is 94 kms. The drive along the National Highway 31 from Siliguri to Sevoke (21 Kms. ), specially after Salugara, a small Bhutia and Gorkha dominated bazar on the outskirts of Siliguri, was smooth over well carpeted road. Incidentally, this small bazar Salugara is quite on the international map because of presence of “Kalachakra”, a holy Buddhist monastery where His Holiness the Dalai Lama comes periodically to perform the “Wong (World Peace) Prayers” that is attended by thousands of devotees from the Darjeeling hills, Sikkim, Bhutan and Nepal. I have noticed that one prominent personality who also visits the place is no other than Hollywood Actor, Richard Gere. Almost adjoining Salugara is the Sevoke Military Cantonment with neat and well laid out barracks, gardens and freshly mowed lush green lawns. Most of the Military cantonments all over the world are alike with neat clean areas, well laid out blooming gardens, rows of neat barracks and lawns to match. It is heartening that Indian Army is now on a warpath towards environmental up gradation promoting greenery and eco preservation in all cantonments. Nature caring Army is good for the health of the country. After crossing the cantonment on either side of the National Highway the smooth, well carpeted road knifes through a packed jungle on either side right up to Sevoke. Thereafter it is another 3 kms of zigzag road up to the historic Coronation or Tiger Bridge that spans across Teesta River rumbling down to the plains from North Sikkim. Coronation Bridge was named to commemorate the coronation of King George VI. The design and planning of the bridge was carried out by John Chambers, the last British Executive Engineer of Darjeeling PWD. The construction by Gammon India, Bombay commenced in 1937 and completed in 1941. Unimaginable today but the cost of construction then was INR 4 lakhs. RCC Bridge is supported by a fixed arch, which has its two ends fixed on rock layers on either side of the river. 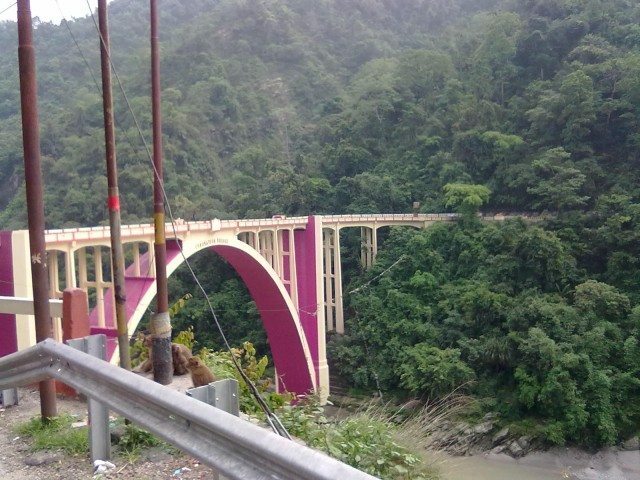 Way back in early 50s, travelling with my father from Kalimpong to Siliguri I used to look at this bridge in complete awe. 72 years old and going strong but there is definitely a need to preserve this historic bridge by proper maintenance and traffic regulation, specially keeping in view that the engineering design of the bridge built then may not have catered for the continuous rumbling heavy traffic of today carrying thousands of tons of loads every day to and from Bhutan and the seven North Eastern States. Hope the Government is listening. After the Bridge, condition of the road is not so good and pot holes start appearing and disappearing. We cross Mongpu, a small bazar with a forest check post about 5 kms from Coronation Bridge, and pass through “Dooars” area. As the name suggests, it means a gateway to Bhutan from North Bengal plains. The Dooars valley is paradise of biodiversity with combination of thick forest that stretches up to Nepal and Bhutan, famous wild life sanctuaries and numerous Tea Gardens in its lap. In other words it is greenery all along except for the villages and bazars dotting the National Highway. It has Jaldapara Wild Life Sanctuary, Buxa National Park, Chapramari Wild Life Reserve and Mahanada Wild Life Sanctuary. Gaps between forest areas and wild life sanctuaries are covered by acres and acres of green carpeted tea gardens on either side of the road, another British legacy. Teesta River and its numerous tributaries spiral down from Sikkim to Sevoke through Dooars. For lunch we had tea, hot “Samosas” and “Jalebi” in a roadside sweet shop in Maal Bazar, half way to Jaigaon. In my opinion, while travelling, even in a not so hygienic road side dhaba or sweetshop, any food that is sizzling hot from the pot is safer to eat and that’s the norm I follow while travelling. As we drove along, the last about 10 kms to Jaigaon was a driver’s nightmare. The National Highway degenerated in to a dusty crater filled apology for a road. The whole highway was replaced by ugly craters and unending cloud of dust. Heavily loaded rumbling trucks from the North East States and Bhutan were precariously balancing between deep craters. Some trucks had fallen by the way side unable to manage their center of gravity in deep craters. Unfortunately, India’s National Highway to Bhutan and the only land link to the Seven Sisters of the North East States had degenerated into a national shame. I understand it is improved now. But how a Government can allow a National Highway of such strategic importance to come to such a mess is beyond one’s imagination. I can only say, “It happens only in India”. Finally after what seemed an endless crater driving, we reached Jaigaon, another small township slightly bigger than a bazar. As we crossed the gate and entered Phuntsoling, it was a different world. It was a refreshing change from the chaos of normal Indian Bazar of horn blaring traffic, senseless parking, crisscrossing cyclists and cycle rickshaws to quiet and orderly kingdom. Bhutanese style rows of buildings lining the main road that was well regulated with disciplined traffic and parking. We checked into Hotel Dragon Inn, a medium range Hotel with complete Bhutanese décor, neat and tidy. By the time it had started drizzling and we decided to stay indoors and check the bar and restaurant. The hotel including the restaurant was staffed by young Bhutanese girls in “Kira”, their traditional wrap around skirt like dress with loose brocade coat with big and folded sleeves. Little girls looked very smart and sober. We had vegetarian dinner in the restaurant and retired to our rooms so as to get early morning start the next day for long drive to Phuntsoling. Next morning, obtaining the permit to enter Bhutan, even with the help of our Travel Agent representative, took us about 3 hours, shuttling as we did, between the two sides of beaurocracy, Indian Consulate and Bhutanese counterpart as also the Bhutanese RTO Office for the Vehicle Permit. We could finally start only around 11 am. Distance from Phuntsoling to Thimpu is 180 kms and the road climbs up through steep gradient to Richending, 1312 feet, and a distance of 5 kms from Phuntsoling. It has a Check Post where permit to enter Bhutan papers are checked and stamped by the Police. 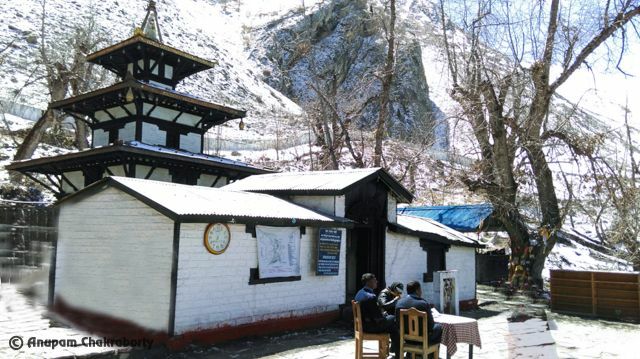 There is also a famous Kharbandi Gompa on the ridge line offering a good view of Dooars plain. After clearing the papers we drove on along the highway which takes a long twisting and turning climb through tropical jungle with few hamlets along the way. From Gedu the road somewhat levels as it runs along the ridge line offering spectacular view of landscape, meandering river and waterfalls. Thereafter it is a combination of up and downhill drive up to Chapchala ridge from where the road descends down to gorge and follows the river upstream to the river confluence and road junction at Chunzom where we find another check point. From here a road branches off to left leading to Paro and Haa and the main road continues alongside the river to Thimpu. The traffic was thin and not at all crowded with only few SUVs, cars and Indian trucks plying up down the road. There was no restaurant or “dhaba” enroute, we missed the ever present road side “dhabas” that dot the Indian Highways. A small wayside village called Kamji with few houses, half way across; served us much needed hot cup of tea. We opted against ever present Maggie noodles and settled for some biscuits and fried “pakoras” that we struggled to chew. We also bought cottage cheese and cucumber to munch on the way. As we slowly cruised along the highway and entered the capital I could feel the distinct difference the disciplined Bhutanese traffic as against the chaotic Siliguri traffic where cycle rickshaws and Auto rickshaws, load carrier cycle rickshaws called “Thela” are the kings of the roads. Thimpu was a disciplined traffic, no traffic police and no horns that I felt rather odd and unnatural having experienced the Indian roads all my life. We hit Thimpu proper at about 5.30 pm and found our hotel, Dragon Route, bang on the main street near the public square. It was drizzling but the weather was cool and pleasant. Wearing hat and a light jacket helped. We checked in and found the rooms with country type pine wood paneled walls and wooden floors. Modern Bhutan, with two party democracy, has come long way from the old feudal Bhutan. As per a UN census Bhutan has the highest level of “Gross Happiness” compared to all the countries of the world. It is truly said that quantum of happiness is the result of number o0f desires fulfilled. More the desire lesser the fulfillment, resultantly lesser happiness. TV was allowed only few years back and the Western Culture in terms of dress is not allowed. I guess this is the only way to preserve the heritage and culture of this Small mountain nation. If the flood gate of Western Culture is opened it will take no time to engulf this Kingdom and its simple people. The name of the band was aptly “Ozone Layer”. Modernized but well-grounded at the base of their culture, tradition and discipline. Feeling hungry but not wanting to eat dinner yet, we walked into to, what looked like a beautiful & homely cottage restaurant at the corner of the main street. It looked cozy and homely but alas the look did not match the bakery product. We had tea and some pastry look alike on self-service and left in a hurry. The tempo of drizzle seemed to accelerate towards full blast rain, and it was time for dinner, so we walked into a cane and bamboo interiors restaurant on the main street. I was looking forward to sample few drinks of the new country but there was nothing much displayed in the bar. Except for the national product whisky there was no rum or brandy or other “foreign liquor” that we are so used to. I asked the barman if they had tinned Tibetan “Chhang”, rice beer, made in Tibet that I had sampled in Sikkim having changed hands in Nathula Border Trade. I was told it was illegal to have that kind of import. We decided to give the usual drinks a miss and ordered dinner of Momo, Thukpa (Noodle soup) and salad, nothing much to talk home. We walked back to the hotel and slept early. Nicely written post! Love the details of your road journey… it is a place I am very much looking forward to doing, waiting for the next bit! Thank you Naturebuff glad you liked the post and that you are inspired to do this trip. Please do it and all the very best. Hi mani , Enjoyed reading about your road journey from Siliguri to Bhutan .I read your other blogs too.I love you descriptive writing style.You do not just travel but keenly observe everything, the flora n’ fauna and the culture of the place which makes the narrative doubly interesting .Photographs give that extra zing to the article .Looking forward to read about the rest of the journey . One wishes to be there physically in those beautiful surroundings .Keep travelling and keep writing.God willing we may also join you on one of your trips.No harm in wishful thinking !! All the best .to you -mani the wanderer !!! Hi Veena.. could you please tell me that personal vehicle from India is allowed in Bhutan of not..? Thanks for such a nice narrative of your journey, road condition and other minor but important details.Difference between chaos on Indian roads and disciplined traffic in Bhutan is notable and in our country we should try to turn the unruly traffic into some sensible one.In India day by day driving is becoming riskier and full of tension as almost all of us don’t follow the basics of traffic rules. Its high time to issue DL only after proper training,exams and practicals. Thank you for your constructive comments and yes, as a nation we need to take urgent and decisive action to bring a sense of discipline in our most chaotic traffic. In the Western countries they have system of strict training followed by stricter examination before issuing DL or else we are at the mercy of drivers who are neither trained nor have common sense as a road user. As a result there are so many accidents and so many lives are lost. Reading your log, there is this strong urge to just head-out and be there. I have seen this bridge on my trip to Gangtok from Siliguri and it looked surreal. You cross over and you are in a different country, in a true since since Bhutan, as you rightfully noted, is indeed a different place. I just wish someday I will also take the same road to reach there. Very well written and I think the condition of the road is better now. Nice descriptive and informative post! All the highways and roads leading to China are strategically deigned with potholes. That is the whole idea. Yes, the first thing when you step outside India is the absence of horns and the orderly conduct of the traffic. It seems rain is always chasing you. First in Darjeeling and now here. In the coming summer, please take a tour of Marathwada in Maharashtra! Happy journey and happy writing to each one of you. Will be visiting Bhutan in March-2014. Thanks for the excellent blog, “Armystyle”, on the route to Bhutan. Thank you Rudolph, you will have a great trip, Bhutan is a great destination to visit. All the best. I am planning to visit Thimpu in March 2014 by road. Please suggest which road should i follow- Guhwati to Thimpu or Siliguri to Thimpu? Please advise based on travel time and road conditions. I would suggest Siliguri to Thimpu route. Guwahati route will take you to Eastern Bhutan towns like Samdrupjhonkar, Yangphula, and Tashigang from where you have to take the East-West Highway and the status of which is not very clear to me. It is going to be a long haul but if you have the time and will to explore the unknown Eastern route would be challenging. Do visit Paro and trek to Taksang Gompa if you can. All the best and have great trip. Hi mani it was nice reading your description of travel from siliguri to bhutan. We are planning to cycle from siliguri to bhutan from 4th april onwards. It would be a great help if you could tell us what to accept as cyclist including the gradient on our way upwards. Waiting for your reply and wishing you many such wonderful journeys. Wonderful post and I would imagine this is just a glimpse of your wonderful journey. Congratulations on your flair for writing and travel. I and my wife are planning something similar in June this year. (Planning might not be the right word, more like “thinking of”). 1. I plan to make the trip in my i20. Is it feasible? Do I need an SUV? 2.If you think I can make it in my small car, what papers are needed for the vehicle permit to Bhutan? Anything apart from normal papers? 3. How to book your homestay in Siliguri for June. Kudos for your precise notes. I plan to drive from Bagdogra to Thimpu in Oct. What would the approx time be for the drive to Pheuntsholing. Is night driving safe and possible in the Thimpu Pheuntsholing sector ? I am travelling with my family in a SUV, of course all adults now. great…inspiring…wr do u live please? Wish to visit Bhutan during June 0r July for a week. Any package from Siliguri,by Road or Rail, pl.We are a couple. Dear Mr. Singh – You can read about personal travel-experiences as well as get useful information about places at Ghumakkar. If you are looking for travel packages then you would need to find a travel agency who organises such tours. Ghumakkar doesn’t sell packages or organise tours. Thank you. You can find many travel agencies in the net who conduct tours all over including Bhutan. As regards visiting Bhutan any time is ok except the monsoon period from June to Sep.
Dear sir, very nicely written with vivid recollection of details. will be very useful for me. Thanks & visit some other place also to write about it. I would like to know if there is any public transport system exist from phuntsoling to Thimphu? Please reply. I am planning for a road trip! Any suggestions? Do you think the Cooch behar-Alipurduar-Jaigaon road is convenient from Bagdogra? Yes there is bus service from phuntsholing to Thimpu and the road is Shiliguri- sevoke- coronation bridge- New Mal- Binaguri- Jaigaon-Phuntsholing. All the best, have a plesant trip. I accidentally came across your log of a few years back and instantly loved it. Quite a storyteller you are – esp. travel telling. Just couldn’t stop from sending a complement with the hope you are still sticking around. Last post on this site is June,10th 2015.
thank you for your most kind and encouraging comments. I am so glad that you liked the article on Bhutan. Yes I have not been in Ghumakkar for quite sometime as I have been busy past one year writing the History Volume 3 of my Regiment, The Assam Regiment which I have just finished and submitted to the publisher. Nevertheless it is a good feeling to read such positive feedback about my writings. Thank you once again and God Bless. Visa is NOT required but please carry a photo identity card to enable the Indian Desk to give you permit. If you want to take a vehicle you need to carry the original papers of the vehicle as well as driver’s photo ID card and licence. Any thing else you may contact me at makghat4@gmail.com. Your blog is quite detailed and helped in planning my trip to Bhutan in June. We are 12 bulleteers riding from Mumbai till Bhutan.Our first halt before entering Bhutan and last halt after exiting Bhutan will be Siliguri. Since, you live in Siliguri, it will be of great help to us if you can provide information on any place to stay and has parking facility for our bikes. Also need to know, what if someone doesn’t have a passport, can he still goto Bhutan? If Yes, what is the procedure to acquire the permit? Thank you for your remarks and the queries thereto. Firstly, accommodation in Siliguri with parking facilities for bikes following options I can suggest:-1) Hotel Cinderella in Sevoke road just outskirts of town on way to Bhutan should be convenient. I think it is vegetarian. 2) Hotel Sinclair also on the outskirts along Champasari Road very close to Darjeeling More that you will have to pass through. 3) Mainik Lodge in Hill Cart Road. it is State Govt property hence would be cheaper. You will have to check the rest in the net. Secondly, it is not necessary to have passport to enter Bhutan but a photo ID is essential to make entry passes at the Indian Counsel office at the entry point town, Phuntsholing. Thirdly, for permit to enter Bhutan you have to take a pass issued by the Indian consulate office, Phuntsoling. Also for vehicles/bikes passes are issued y the RTO Office Govt of Bhutan for which vehicle papers, driver’s licences and Photo ID are required. For further query you may contact me at makghat4@gmail.com. Wishing your biker gang a all the very best. Enjoy the journey. hi, can i connect with you? Please can you give me your number- i am planning a ride from Siliguri to Paro and wanted to know how to go about hiring a vehicle etc. Yes, good decision tour to Bhutan. Bhutan tours can give you a magical experience, where you can explore a lot if you love adventure or trekking. If you want to enjoy the Bhutan trekking then you can follow this best tour operator Bhutan Mahayana Tours. It can provide lot of facility in Bhutan tourism. Recently my family visited there for 7-9 day and enjoyed a lot. Hi Mani! Loved your blog on visit to Bhutan from Siliguri. I have decided to go there via same route in the first week of Jan 2019, though for a short trip of 3-4 days. Your experience will be of great help. Thanks for nice and informative article. thank you Rajesh, glad you liked the article and wishing you an enjoyable trip. Try not to miss Taksang Gompa. भविष्य में कभी दुबारा घूमने का प्रोग्राम बने तो vmc.system@gmail.comपर मेल करिएगा . It is not a star category hotel but undoubtedly the best of the lot. Hotel owner endeavoured to preserve the past glory by hanging photographs of Mr Bachchan with him and some film shots of ‘Khuda Gawah’ on the walls. Staying in this hotel was comfortable; it had 24 hours hot water facility and free wifi. The foods were nice but they cost too high.